Slow healing after extractions or oral surgery. Oral infections including fungal infections such as thrush. Dry mouth and taste impairment. the names of any medications (prescription as well as over-the-counter drugs) you are taking. QUIT smoking - smokers have higher levels of gum disease, caused by poor blood circulation in the tissues around their teeth. People with diabetes who smoke have an even greater chance of having severe gum problems than non-smokers and non-diabetics. Keep to your healthy eating plan and take prescribed medications as your doctor directs. Brush twice a day with fluoride toothpaste and a soft brush. Take care to remove all plaque on and between your teeth, and next to the gum line. If you have dentures, remove them overnight and clean them daily. Visit your dentist or other oral health professional regularly. Book your appointments for the morning when your insulin level is more stable. Try to control your blood sugar level. Those with high blood sugar levels are more likely to have more severe gum problems. 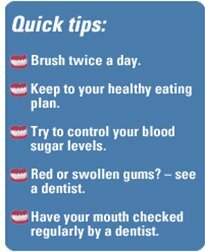 If you have good control of your blood sugar level and good oral care, you should have minimal problems with your oral health.